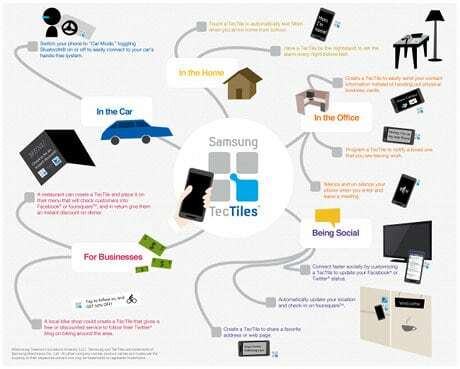 Sets of five TecTiles can be ordered online or bought in store for US$14.99 from all four major US carriers and can be used to program a variety of NFC-initiated functions. “Most of the tag types you make will work on nearly all phones which have NFC hardware,” says Samsung. Samsung has launched an own label range of NFC tags and an NFC programming application for its range of Android-based NFC phones. 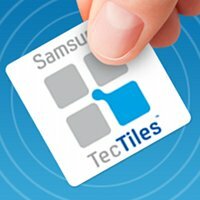 The new Tectiles NFC tags are available for US consumers to purchase in sets of five for US$14.99 online and in-store at AT&T, Verizon, Sprint, and T-Mobile — all four of the major US carriers — as well as direct from Samsung. The companion Samsung TecTile programming application, which is available to download free of charge from Google Play, will allow consumers “to automate everyday functions of a smartphone including sending a ‘headed/at home’ text message, silencing the phone when entering a meeting, setting an alarm, and dimming the display when going to bed,” says the company. Settings and applications — Change phone settings (Bluetooth, WiFi, ringer and media volume, screen brightness etc), launch an application, join a WiFi network, show a message. Communication — Make a call, send a text message, start a Google Talk conversation, share a contact or business card. Location and web — Show an address on a map, open a web page, check in to Foursquare or Facebook. TecTiles can be reprogrammed as often as needed, or permanently locked to prevent any future changes. Oh, Lord, NFC is about to repeat the same mistakes the QR/2D barcode industry made – Let’s confuse the public with a lot of custom branding. All the clever brand-identity experts are idiots.